Hiya guys! Talk about a crazy weekend! Of course I had last minute shopping to do. Not only was I stuck in long lines, but I kept being shoved a million times. Tis the season alright. But just a few days left and I feel like a little kid wondering what Santa is bringing haha. If you're not in the holiday mood I think the shades I am going to be showing you will change your mind. 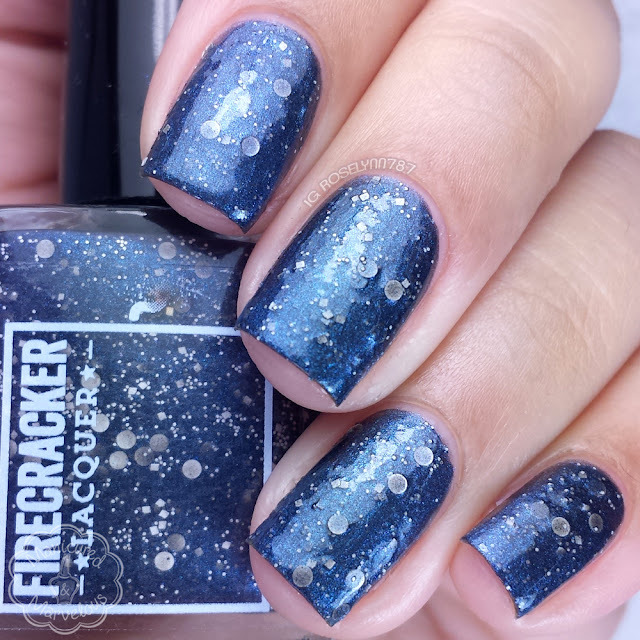 For today I am sharing swatches for the beautiful wintry The North Remembers collection by Firecracker Lacquer, which will be releasing later this week. These are so perfect for the season! 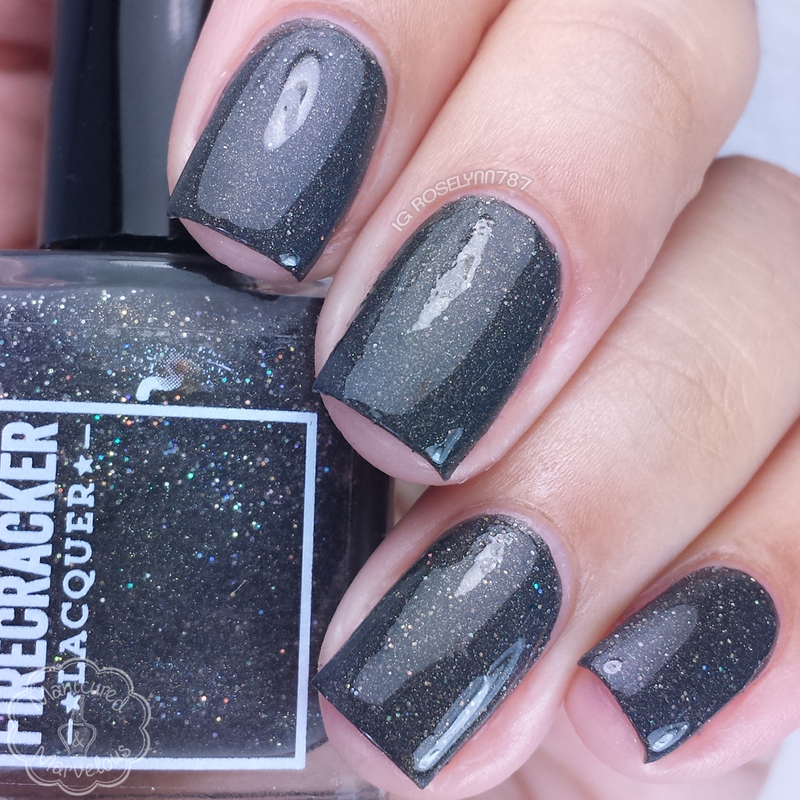 The North Remembers collection by Firecracker Lacquer will be available Saturday, December 26th, at 12pm EST. Each bottle will retail for $9 to $11 for a full-size. 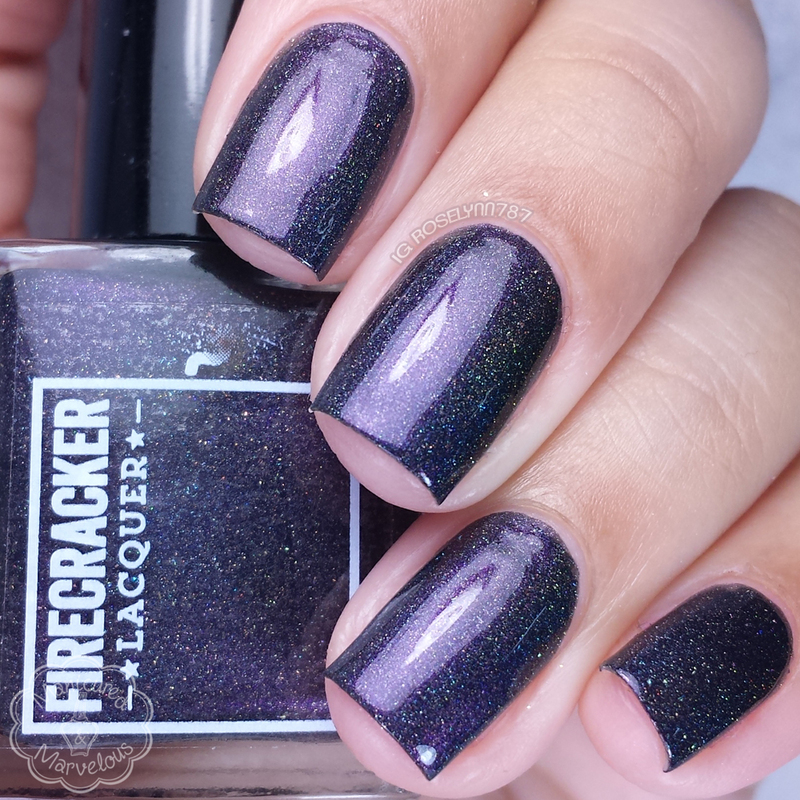 Fear Cuts Deeper Than Swords can be described as a blackened purple lacquer with both linear and scattered holo pigment qualities, along with a brush of holo glitters. I only wish I could of taken photos of this in the sunlight (that's actually true for all the shades here). I adore how dark and lush this shade is. The formula has a great smooth application with a nice even consistency. Shown here is two coats sealed with a glossy topcoat. 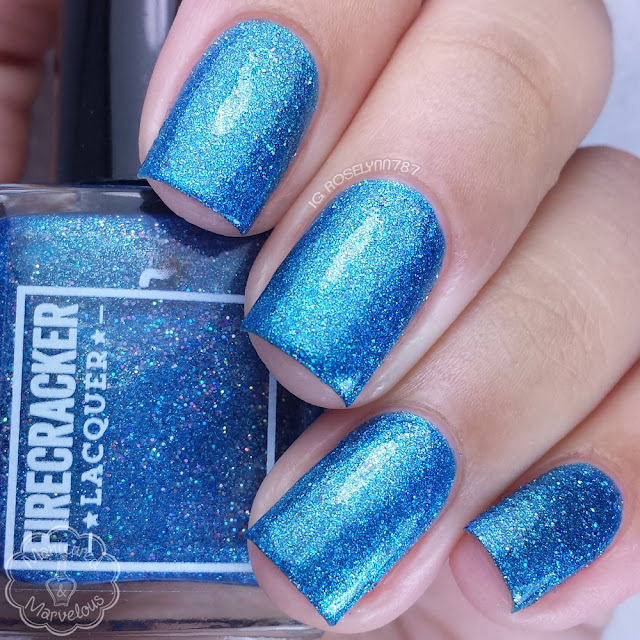 I’d Sooner Be A Wolf can be described as a bright royal blue frosty lacquer with a multitude of holo glitters in different colors. Without a doubt my favorite from this collection, it is jaw-dropping and gorgeous. Beautiful full-coverage is easily achieved as well. The formula has a nice smooth application and the consistency is really opaque in a single layer. Shown here is two coats sealed with a glossy topcoat. 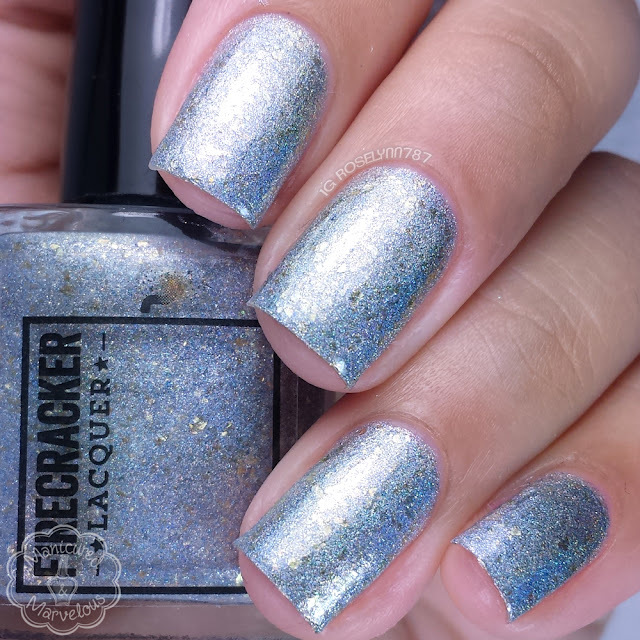 Caution: Winter Ahead can be described as a silver foil lacquer, filled with big gold flakies and tiny purple flakies, along with a linear holo finish. I have to say this shade really took me back because I was not expecting it to look so amazing. Normally my skin-tone clashes a bit with foil and metallic shades, but this was so not the case here. The formula applies a bit sheer, but ends up building up opaque. The polish has a bit of a gritty finish on its own when dry. Shown here is three coats sealed with a glossy topcoat. 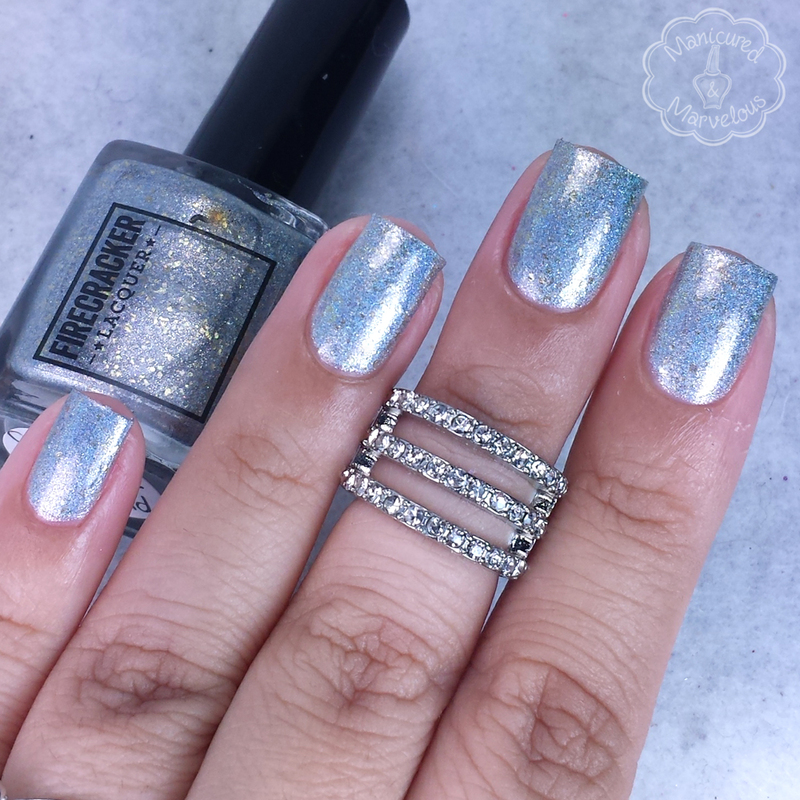 Don’t Be So Dire, Wolf can be described as a gray lacquer with a linear holo quality and a plethora of holo glitters in various sizes. Whenever I see a gray polish I tend to get excited because it's not a common shade in the polish world for me. The formula is great and has the most opaque consistency from this collection. It's pretty much a one coater if you don't use a light-hand like I do. The finish does dry a bit on the gritty side as expected due to the micro glitters. Shown here is two coats sealed with a glossy topcoat. 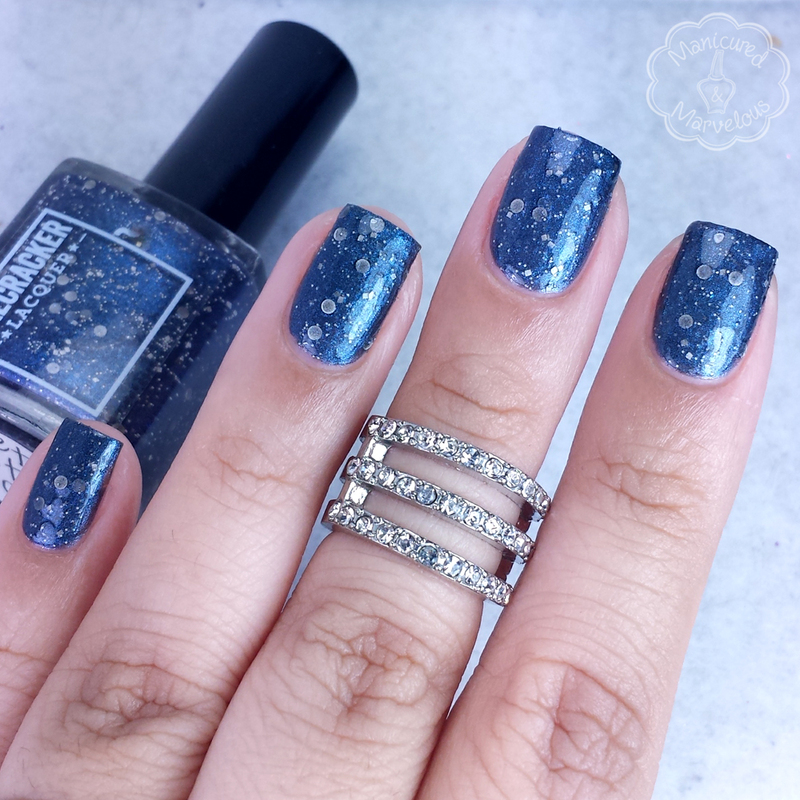 Let It Snow can be described as a black lacquer with a strong blue shimmer, along with numerous white glitters in varying shapes and sizes. I love how perfectly captures a snowy winter night. Definitely another one of my favorites. The formula is a bit sheer, but builds up and evens out nicely. There are ample glitters in each brush stroke so there is no need to fish. The heavy glitters cause a gritty finish when dry, so doubling up on the topcoat is needed for a smooth look. Shown here is three coats sealed with a glossy topcoat. Overall I am actually in love with the entire collection, which I feel doesn't happen often with me. Each one of the shades represents the winter season so well. I love the uniqueness of some of shades like 'Let It Snow'. The collection as a whole definitely has a little something for everyone, especially if you're like me and enjoy darker tones this time of year. Ooh! I love all of these! All of these are absolutely stunning!! Don't Be So Dire, Wolf is my favourite here. Super lovely collection, they look great on you ! Oh man! I fell in love at first sight with Fear Cuts Deeper Than Swords! What a pretty collection! I am especially drawn towards Don't Be So Dire, Wolf. Don't Be So Dire, Wolf if my favorite from the collection! Fear Cuts Deeper Than Sword is SUCH an eyecatching shade, I absolutely looooove it! Holy crap!! 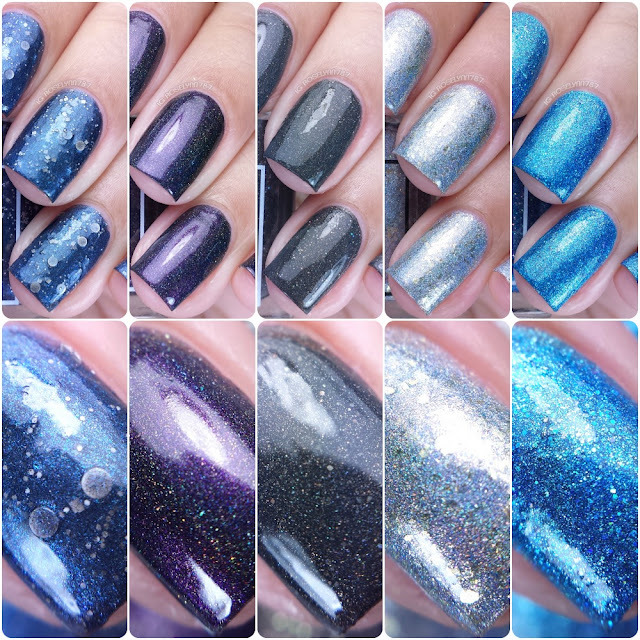 I don't think there's a single one of these polishes I don't like - what a gorgeous collection!! Caution - Winter Ahead is my favorite but these all look incredible! Wow, this is a really beautiful collection! I've never tried this brand before, but I can see that changing soon! I'd rather be a wolf is gorgeous! I trolly envy your swatches, so beautiful! These shades are COOL! Literally and figuratively. Especially Fire cuts deeper than swords. Love. ♥ Thank you so much for the review! You showed them off so well, they are just stunning on you!